Welcome to our Australia page, where we’ve posted videos, links and other resources from our epic road trip to Oz! Besides sharing our destinations, activities and information about our campervan, we’ve included details about the resources we used to plan our trip. First and foremost, after researching every available company, we rented our campervan from Maui because they checked off every box on our wishlist: one-way rentals available, fully-self-contained for Free Camping (boondocking), small enough to fit into just about any campsite (they had larger ones available, but we wanted to go small), very new fleet so we wouldn’t be driving something too old, automatic transmission (driving AND shifting on the left?!) and a long list of included features. They’re also part of the largest RV rental company Down Under (THL) and considering the distances we’d be traveling, we decided that the more support we have available the better… just in case. Here are some of the resources we used to plan and execute our RV trip to Oz. We’ll be adding many more as our trip progresses. T-Mobile – we purchased a T-Mobile data plan for our iPad (we got lured in by the Binge-On video streaming) that allows us to use unlimited 2G data in Australia. It’s not fast, but (1) it allowed us to have internet connectivity from the minute we touched down in Oz… and (2) it has saved our bacon a number of times when we were in areas that Vodafone didn’t cover. It’s always good to have a secondary data carrier, right? Tropic Breeze Caravan Park (Port Douglas, QLD) – situated right in the heart of the resort town of Port Douglas, this caravan park is within easy walking distance of downtown (great restaurants & shopping), the beach (just a short walk out the back gate of the park) and the marina (where our Great Barrier Reef snorkeling trip departed from). The managers were extremely friendly and provided invaluable help with recommendations for things to see & do and places to eat. 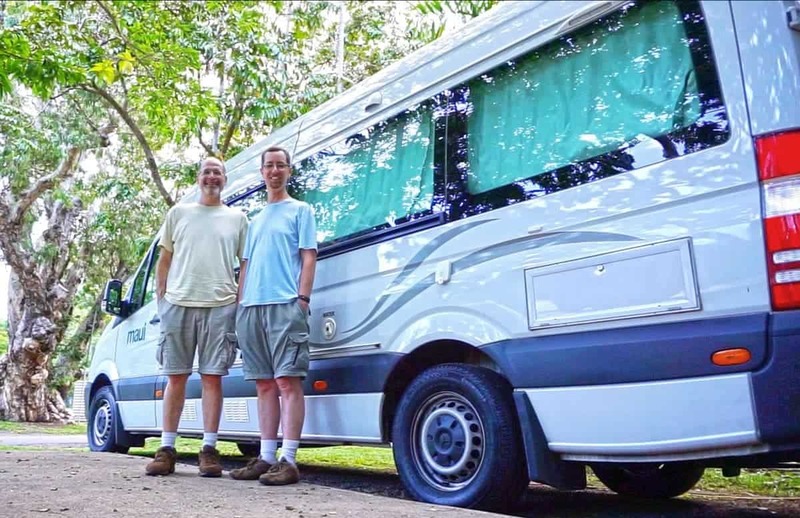 Malanda Falls Caravan Park (Malanda, QLD) – another VERY friendly caravan park. Private stairs lead to Malanda Falls where you can hopefully see platypus (they’re extremely shy) and turtles. Or spot a Lumholtz Tree Kangaroo (who knew kangaroos could live in trees?!) in the surrounding rain forest. Or just check out all sorts of adorable baby farm animals in their petting zoo! Coral Coast Tourist Park (Townsville, QLD) – very nice, clean park… a little close to the airport (not that WE mind), but it was the perfect staging point for taking the ferry to Magnetic Island. Greenacres Motel & Caravan Park (Benaraby, QLD) – with our first week of non-stop movement under our belts, we needed a comfortable & convenient place to catch our breath (and catch up on some work)… and Greenacres fit the bill. Big4 Airlie Cove Resort & Van Park (Airlie Beach, QLD) – wonderful resort town with plenty of shops & restaurants… plus access to the Whitsunday Islands for anything beachy/aquatic you could desire. And after a hard day of eating/shopping/snorkeling/kayaking/etc… who wouldn’t want to cool off in the pool or water park (yes, we’re still big kids)?!?! Big4 Byron Holiday Park (Byron Bay, NSW) – just south of the hip, surf-culture town of Byron Bay, this Holiday Park has everything you need: all the amenities for a comfortable stay, close proximity to town (food, shopping, the lighthouse… you name it), and direct access to beautiful & uncrowded Tallow Beach. It was the perfect place for us to unwind after the excitement of Bluesfest! Big4 Bonny Hills on Rainbow Beach (Bonny Hills, NSW) – another great Big4 Park, Bonny Hills is a great spot to use as home base to explore the area in and around Port Macquarie, NSW. Spend the day relaxing on Rainbow Beach (accessible directly from the park), or head to one of Port Macquarie’s 17 (!!!) fantastic beaches, or visit the Koala Hospital to see the fantastic work the volunteers are doing to help rehabilitate sick/wounded koalas! Boondockers Welcome (they’re Down Under, too!) – we couldn’t think of a better way to connect with locals while in Australia than to stay with them… and Boondockers Welcome came through! Woodgate Wanderers (Woodgate Beach, QLD) – We connected with Doug & Di before we even left North America and were thrilled to find out that they were going to be in town, and had space for us, when we were going to be coming through. They were an awesome source of information about our whole route (not just their immediate area)… and were incredibly gracious and inviting hosts. We’re SO thankful we got to meet them and look forward to connecting with them on their next visit to North America! Grey Cliffs Camp (Yuraygir National Park) – this small, National Park campground afforded us the opportunity to stay the night on a bluff overlooking a secluded and private white sand beach. As if falling asleep to the steady sound of the surf and the fresh salt air wasn’t enough, we also got the chance to be up close to the largest group of Eastern Grey kangaroos we’ve seen on our trip! Maybe even a little TOO close! Wavelength Great Barrier Reef Tours (Port Douglas, QLD) – All-day snorkeling on the Great Barrier Reef. Virtually brand new boat (Wavelength 4) was wonderful… large enough to be comfortable & stable, but small enough (about 45 passengers) that each snorkeling stop didn’t feel crowded. All of the crew were friendly, professional & helpful… and the marine biologists on board were incredibly knowledgeable (and entertaining)! Magnetic Island (near Townsville, QLD) – Just a 20 minute ferry ride from downtown Townsville, QLD (we rode the Sealink Ferry), there are lots of tropical, beachy things to do on Magnetic island. But we went to see Koalas in the wild! Salty Dog Sea Kayaking (Airlie Beach, QLD) – Airlie Beach is a great place to get out on the water and explore the Whitsunday Islands. We booked a half-day kayaking tour and really enjoyed it. The route took us out to White Rock, where we had the chance to snorkel and grab a bite to eat on the sandy beach. Loved being out on the water! Air Whitsunday Seaplane Tours (Airlie Beach, QLD) – We couldn’t be in the area and not get out onto the Whitsunday Islands we’d heard so much about (from EVERYONE)! Our last-minute trip planning meant that there were no boat trips available, and a shortage of time meant we only had a half day to try and get out there… so a seaplane trip was perfect! We chose the Whitehaven Experience Tour… a 3 hour trip out to the world-renowned Whitehaven Beach. It was an expensive splurge… but well worth it! Cape Hillsborough National Park (Cape Hillsborough, QLD) – aside from the dramatic natural beauty of this rugged headlands, the real draw (for us, anyway) of Cape Hillsborough was the chance to see kangaroos and wallabies on the beach… at sunrise! We stayed in the Cape Hillsborough Resort Nature Tourist Park so that we could roll out of bed and step right out onto the beach. We weren’t disappointed! Byron Bay Bluesfest (Byron Bay, NSW) – this awesome musical event happens every year on Easter weekend (lucky us we were coming through town)! With five large, covered venues and loads of food, you can’t help but have a great time. We timed our visit so we could see Jackson Browne, Melissa Etheridge, Brian Wilson and Tom Jones perform (90 minutes each)… and we had a blast! Camping is available onsite: grassy, un-powered sites… but there are showers and water available. Cape Byron Lighthouse (Byron Bay, NSW) – Cape Byron is the easternmost point of Australia, and this beautiful lighthouse is perched right out at the end. Great spot to see up and down the gorgeous coastline surrounding Byron Bay. Yuraygir National Park (NSW, between Coffs Harbour & Yamba) – Yuraygir NP encompasses the longest stretch of protected coastline in New South Wales. It’s striking cliffs, rocky headlands, isolated beaches and quiet lakes are set against a backdrop of forests, heaths and wetlands. We found a spectacular campsite on a bluff overlooking a white sand beach in Grey Cliffs Camp. Plus there are kangaroos! Port Macquarie Koala Hospital (Port Macquarie, NSW) – We are so glad that Russell Mills of the Legendary Pacific Coast told us about the Koala Hospital (see the video). We LOVE Koalas… and it was heartwarming to see the great work the volunteers here do to help rehabilitate sick/wounded koalas, so they can (hopefully) be returned to the wild. Sugarloaf Point Lighthouse (Seal Rocks, NSW) – First lit on December 1, 1875, Sugarloaf Point Lighthouse is not only a fantastic historical monument, but is still an active navigational aid… warning ships of the dangerous Seal Rocks to the south. Perched high on a bluff, it offers commanding views of the surrounding coastline. Just watch where you step! I’m so excited to watch ALL your OZ vids. Julie Bennett @RVLove recommended y’all to us. We found out recently that we have the opportunity to go there in Oct of 2020. And, after reading about your trip so far, it looks like we’ll be doing a similar path. Starting off in Brisbane and ending in Melbourne. Although, there’s no way I’m going to OZ and not Diving the GBR!! So excited to learn all we can from your experiencee!!!! Thanks so much, Monica. We’re so excited for you! Have a blast! I too would like to say welcome home. There is something on which you may be able to advise me. My wife and I are heading to New Zealand in August to visit our son and daughter-in-law. Based on your great adventures in Australia we decided to rent a Maui caravan and camp our way around New Zealand. We will only have 12 days but we hope to make the best of it. Now my question … I have been informed by Maui that I need to provide a $7500 liability bond. This will be charged to my credit on Day 1 and credited back when we return the rig, less any damages (like windscreen, tires, body, etc.) or cause damage to someone else. I am being “offered” a Liability Reduction Offer (LRO) at $45/day to reduce this $7500 to zero. The cost of the caravan is $85/day so this really adds to the cost of our holiday. With campsite fees at say $40/day, this could mean daily fees of $170/day just for transportation and accommodation. That would cover the cost of a decent rental car and hotel room I would think. Anyway, just wondering how you guys handled this Liability Bond issue. Thanks. Thanks for the welcome home, Jeff! We had the option of purchasing the same $45 AUD/day liability reduction, but we actually opted for the more expensive Maui “Premium Package” which included not just the liability reduction, but also the one-way fees (we were traveling one way from Cairns to Sydney), taxi fare from the nearest airport to the Maui branch (which we took advantage of), pre-purchase gas (LPG), picnic table & chairs (which we wanted), and a few other minor items, too. But we see that the Premium Package is not currently listed as an option on Maui’s website, but maybe that doesn’t matter, as you’re trying to reduce costs, not increase them! Just like renting a car, there are a couple of factors we considered for renting the camper. The first is risk-aversion level. What are the consequences and exposure of having an accident with a higher vs. lower deductible? How do we feel about a guaranteed payment of $45/day (which basically would have been spent for nothing if we had no accident) compared to the potential high cost of an accident without coverage (in this case up to $7,500). And very importantly, do we actually need to purchase a lower deductible if our current auto policy or credit card already covers us? That’s the first thing we would look at. We use a credit card that automatically covers the typical collision damage waiver for most car rentals. So if we were to pay a car rental company for a CDW, it would be a complete waste, since we’re covered already. In this case, our credit card did not cover us for the camper, so we decided to keep risk low and have a lower deductible. You will of course need to determine the level or risk aversion that you’re comfortable with. There’s also the issue of needing a credit card with at least a $7,500 credit limit to charge the deposit to should you decide to forego the liability reduction. We have that, so that would not have been an issue for us had we opted to go that route. One additional factor….. The cost of our Ultima Plus campervan was about $195 AUD/day, so maybe the fact that the liability reduction apparently costs the same for all rentals made it easier for us to justify, since it was a much smaller percentage of the overall cost compared to the less-expensive rental that you’re doing. Pingback: Campervan Return, Expenses, A380 Cockpit Tour + Bloopers! I’ve been having a wonderful time following you two on your adventure. I don’t fly so it’s very unlikely I will ever get to that part of the world. However, the videos you’ve provided, especially the high resolution and clarity, have allowed me to see and feel all the beauty and excitement from such a trip. I look forward to the next clip. Thanks for letting us know that you’re enjoying our videos! It’s so wonderful here that you might just have to board a cruise ship and come on down! ? We also used the Maui Van on one of our adventures in the land of OZ. Sixty days from Darwin to Sydney with a side trip to Tasmania. The Maui van was one of the best motorhomes we ever rented. We used campgrounds every night because of the heat. Thanks for bringing back our memories of a great trip. Very interested in your review of the Sprinter van in which you are traveling. Since our kids are all grown, we sold the 40 foot Safari and purchased a Pleasure Way Plateau. This will serve as our “short junket” vehicle until we are ready to move full time, at which point we will move up again to a 28-30 foot. For an individual, the Sprinter is just fine. Just a bit too small, IMO, for a couple. Best to you both and bravo on such a fine job! This would be too small for us to own, even if not full-timing. But it’s great for a holiday like this because it fits anywhere! Not such a good boondocking-in-hot-weather choice though, as not enough windows open or have screens. We’ll have more videos about various systems coming soon. Hey guys, I lived in Australia for 4 years before moving back to the states. Wish I was there with you….I miss my second home dearly. Wanted to tell you how I went about driving on the other side of the road (advice given to me by another American). When you come to a turn say out loud “short left long right”. Short left refers to the fact you don’t cross over a lane to turn whereas long right refers crossing over a lane. This helped me remember every time I was turning until it became automatic. BTW, for me parking lots were the worst for driving opposite….maybe due to the fact many parking lots don’t have lines. Anyway, have a great time and tell everyone hello for me :) haha. That’s great Pennie! We’ve been thinking about the same general idea when turning, but love the idea of saying your concise verbiage out loud. And you’re so right about parking lots! We’ll say “G’day” to everyone for you. ? Good’on ya mates! Thanks for the updates. So, how was the first hour of driving on the left? No fatalities so far! ? We shot video of the very first moment. Stay tuned!